About Tenleytown, D.C. | Tenleytown, D.C.
For far-reaching views and natural beauty, the region of country penetrated by Wisconsin Avenue can hardly be excelled anywhere. Nestled in upper Northwest DC, Tenleytown is the District’s second oldest community. A blend of quiet neighborhood and urban center, Tenleytown is a wonderful area to live, work and explore. For those who are new to Tenleytown or who want to get to know the neighborhood’s history a bit better, take a walk along Top of the Town: Tenleytown Heritage Trail. 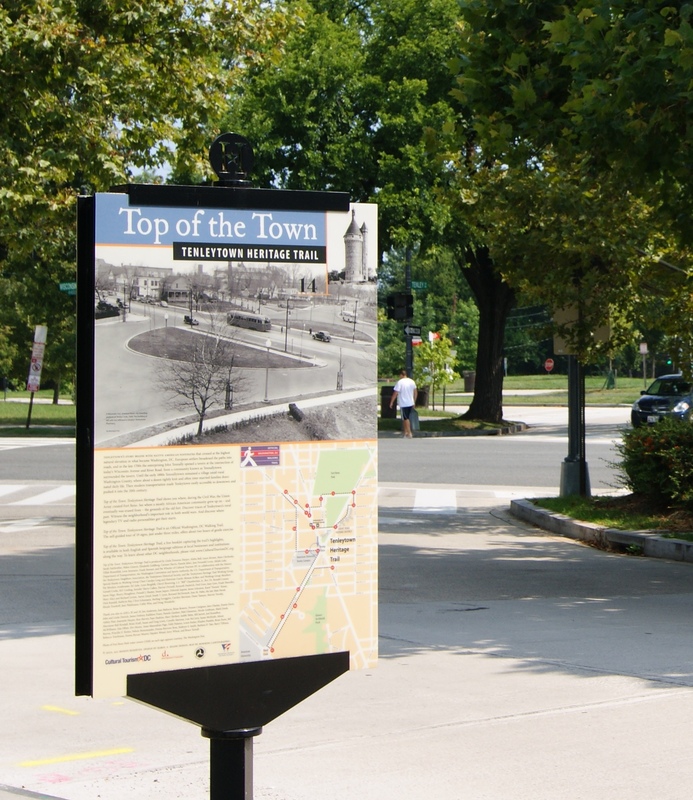 The trail, which is a project of Cultural Tourism DC, covers a little more than three miles, and through 19 site markers highlights key areas, landmarks and eras in Tenleytown’s past. At a leisurely pace, one can enjoy the scenery, compare pictures of yesteryear with the neighborhood today and take in all our community has to offer. A trail guide and map is available for free at the Tenley/Friendship Library or online. Tenleytown, D.C.: Country Village into City Neighborhood, written by former resident Judith Beck Helm, also provides a fascinating historical narrative, covering the neighborhood’s earliest days before 1790 up until 1981, when the book was originally published. Copies of the book are available for purchase at Politics & Prose Bookstore, and can also be found at the Tenley/Friendship Library. Information on current Tenleytown associations, government organizations and community resources can be found on the Useful Links page of this site. Please send us any links or groups we might have missed by emailing us at tenleytowndc@gmail.com. Read more about why we decided to dedicate a website to Tenleytown here.